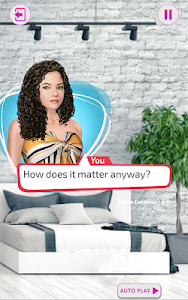 From the creators of the highly successful Friends Forever Stories, Decisions - Choose Your Interactive Stories Choice is a new visually immersive game which will get you hooked in a heartbeat! Get drawn into a world of compelling multiple chapters stories where you can take the reins of destiny in your hands and decide for yourself – no compromises, no judgments and no holding back. Live your life the way you’d like to. Make a bold decision in each episode and watch how your story unfolds. Read a genre that suits your mood – teen drama, rom-com or suspense. You have unforgettable titles to choose from! Get ready to go on story adventure games that offer fun and surprising twists. Experience college drama, fall in love again or uncover hidden agendas. Make choices, go through exciting chapters, live different lives and enjoy unique outcomes. You’ll surely enjoy taking charge of your destiny. Get started now! Decisions - Choose Your Interactive Stories Choice presents stories with visuals and animations, which are punctuated by options popping up on your screen for an incredibly interactive experience that will hook you from the start of every episode, right to the end. 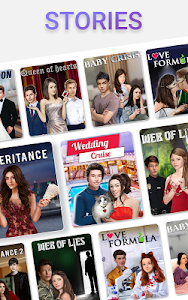 Download Decisions - Choose Your Interactive Stories Choice, the best story games free from the Google Play Store and immerse in some of the most impressive chapters you'll ever lay your eyes on!
? Exciting dress up options.
? Several genres to choose from.
? Make your decisions in visually engaging stories. The choice is always yours to make. Your decisions will turn these interactive stories into your very own adventure. With our amazing character customization options, you can design your looks and create your version of the main character, as you like it. 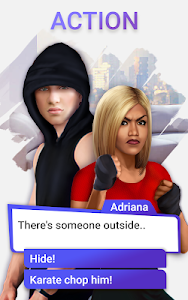 Download Decisions - Choose Your Interactive Stories Choice free from the Google Play Store and choose your own adventure now! What if you get a chance to live your life differently? That’s exactly what happens to a shy barista of the Shallowsilver Kingdom who finds herself at the royal castle trying to win the Prince’s hand! So will you live up to the demands of the castle life or cave under pressure? Your BFF is 17 and pregnant! She’s hormonal, clueless and a target for the bullies. To add to the complications, you are attracted to her bad boy brother while you figure your feelings out for your other friend. Will you make the right choices? How will you support your BFF through her testing times? Where will your decision lead you? It's all up to you - download Decisions - Choose Your Interactive Stories Choice now and let your own story come to life! Decisions: Choose Your Interactive Stories Choice require ACCESS_COARSE_LOCATION : This permissions is required by ad networks. Please note that we use Advertising ID for serving better ads and improving the product through Analytics. Contact us at [email protected] for any problems.
? New Story - Amulet of Osiris out now! A research trip to the Ancient city of Cairo leads to more adventure than you bargained for.
? Amulet of Osiris available in Portuguese, Spanish, French, Russian, German and Japanese.
? The language translations issue in Double Trouble 2 is now fixed. Similar to "Decisions: Choose Your Interactive Stories Choice"